When Secretariat stepped off the plane in Toronto, Ontario, for his final race, he was greeted with a hero’s welcome, complete with news journalists, photographers and television cameras rolling. In those days it was very unusual for racehorses to travel by air, and even Secretariat had never been on a airplane. But the Big Red Horse seemed to understand he was the toast of the racing world, and handled the plane and the press with ease. Like visiting royalty. Owner Penny Chenery realized that Secretariat had become a huge sports star, with television carrying his racing exploits to millions of fans. Chenery also understood that most of her horse’s races had been in New York, with fans afar having little opportunity to see their hero in person. With the summer and fall classics completed, and with Secretariat scheduled to leave the racetrack to head to Kentucky for a new career as a stallion, there wasn’t an opportunity to make a tour for her champion. But she decided to run Secretariat one more time and accepted an invitation to the Canadian International Championship Stakes at Woodbine Racecourse, Canada’s leading track. The trip to Canada was also a tip of the cap to Secretariat’s trainer, Lucien Laurin, and rider, Ron Turcotte, both native Canadians. Amongst the press assembled for Secretariat’s arrival that day at the Toronto airport was an independent television film crew, which would produce a remarkable video documentary of Secretariat’s trip to Canada. Called “Big Red’s Last Race” it is incorporated in entirety in a new video entitled “The Life and Times of Secretariat. Nostalgia buffs will enjoy the 1970’s long hair styles and mutton-chops sideburns of the younger guys in the Canadian piece. But it is a decidedly un-mod fellow who handles the TV narration. The turf authority is older than the young guys with the mutton chops, and straight as an arrow – except for one thing: he’s wearing a blue wool overcoat with a ridiculously fluffy WHITE fur collar. It’s just the oddest-looking thing you’ve ever seen. Like ostrich feathers on Edward R. Morrow. Anyhow, the narrator is not the only sight to see in the video. On the distaff side, there’s beautiful American jockey Robyn Smith, who is in to ride Triangular, one of Secretariat’s opponents in the Canadian International. Smith later married Fred Astaire. Wily Canadian champion jockey Avelino Gomez will be aboard Kennedy Road, the Canadian grass champion who has also won several big turf stakes in the U.S. The trainer of Kennedy Road says his strategy against Secretariat is no secret. The piece shows old-time footage of Man o’ War (the original “Big Red”) in a match race in Canada in 1920 against Kentucky Derby winner Sir Barton. 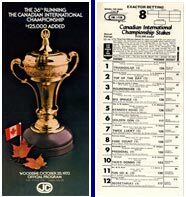 Then it comes back to Secretariat training over the Woodbine course for the final race of his career. The morning sequences of Secretariat preparing for the Canadian International are beautiful, and shot from unusual angles. As the mists lift at Woodbine, The Big Red Horse is a flying black silhouette in the distance, set against a gray morning sky. Then he bends towards the camera and we hear his hooves rhythmically clipping the dewy grass – clicking off five furlongs in a crisp :57 3/5. By race day, the late October temperature dips to 35 degrees. But smiling in the stands, Penny Chenery talks about how her horse fits into the sport. 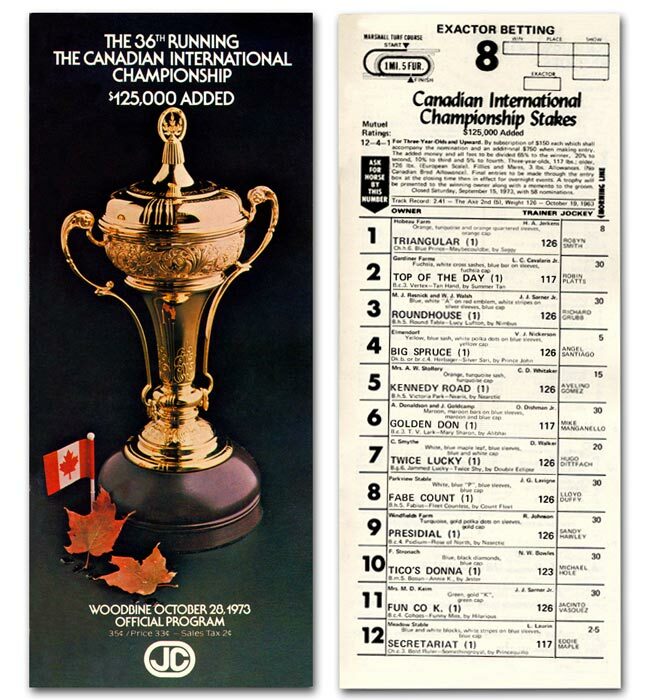 Secretariat won the Canadian International by 6 1/2 lengths, with Big Spruce closing to be second ahead of Golden Don. One thing didn’t go quite according to plan. Regular rider Turcotte, the native Canadian, was under a 5-day riding suspension and could not be in the saddle that day in Toronto. Instead, trainer Laurin called upon Eddie Maple, another Meadow Stable regular to handle Secretariat in his final start. Maple clucked and Secretariat was gone. One is left with a wonderful, lasting image from that late October day in Canada: Secretariat turning for home through light snow flurries – front legs pumping like powerful pistons, with mammoth clouds of wind blasting from his nostrils.